Can Healthy Foods Reduce Bloating? Bloating is a common complaint and can leave people feeling uncomfortable and fatigued, especially after eating. There are many symptoms of bloating but it is generally characterized as a feeling of tightness or fullness in the abdomen and normally goes away on its own after a little while. The reason behind bloating is water retention or trapped gas in the intestine, and there are many factors that can lead to this. One reason is diet, as foods have a direct effect on the amount of gas produced within the digestive tract. 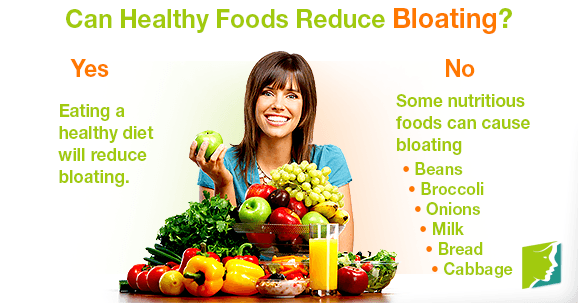 Therefore, many believe that if they eat a healthier diet, they can solve their bloating problem. Read on to find out whether or not healthy foods can reduce bloating. Herbs are a healthy and tasty way to season food, and they can help reduce bloating. Although the herbs will not generally reduce bloating per se, if they are used instead of salt, the problem can decrease. This is because salt draws water out of cells, causing the body to overcompensate and hold on to more water, resulting in water retention. Herbs have a range of other benefits for your health, too, so experiment with different ones and ditch the salt in cooking. Eating a healthy diet will reduce bloating on account that unhealthy junk foods are not being consumed. A diet high in junk food can lead to bloating because sugars increase the production of gas. By replacing processed foods with more wholesome options, you will be automatically reducing bloating. However, unfortunately, some thought has to be given to the particular healthy foods you are replacing your junk foods with, as some nutritious foods are known to cause bloating. All of these foods are full of nutrients and excellent for overall health. However, they also have a tendency to produce gases, and these can get trapped in the intestine, causing bloating. In people who suffer from mild bloating, simply cutting back on consumption of these foods is best, as the sufferers can still benefit from the nutrition value. However, in people with severe bloating, these foods might need to be avoided altogether and nutrition received from other healthy foods. In essence, a person with a healthy diet full of wholesome foods is going to, as a rule, suffer from bloating less than a person who has a mainly processed diet. However, even though a healthy diet can reduce bloating to some extent, certain healthy foods can exacerbate it, and so care must be taken when choosing a diet plan, or the bloating might not be reduced as anticipated. Take a look at other alternative treatments for bloating.